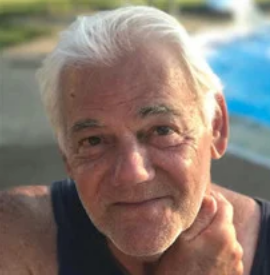 Gabriel “Big Gabe” A. D’Andrea Jr.
Gabriel “Big Gabe” A. D’Andrea Jr., age 70, of North Versailles (Formerly of Wilkinsburg) passed away on Friday, February 8, 2019. He was born October 20, 1948 in Pittsburgh, a son of the late Gabriel and Helen D’Andrea. He was a member of St. Robert Bellarmine Church in East McKeesport. He was the past owner of True Value Hardware store in Oakland and then went on to his life's work in construction as an independent general contractor. He found joy in golf, woodworking, coaching football, rooting for the Pittsburgh Steelers, cooking and having a great time amongst family & friends. In addition to his parents, he is preceded in death by his sisters Patricia Thomas and Carol Kinavey. He is survived by his Brother John (Aliene) D'Andrea; Nephew Anthony D’Andrea and his sons Anthony and Samuel; Nephew Adam (Megan) D’Andrea and their sons Joshua and Ethan; Nephew Craig Thomas; Niece Ashley Thomas and children Gabriel A. (Kelly) D'Andrea III of Pittsburgh and Amanda Lynn D’Andrea of Plum; grandchildren Sawyer and Tobias D’Andrea and Mackenzie Sum. "Big Gabe" was many things to many people. Friends and Family will be received from 6 to 8 p.m. Sunday and 2 to 4 and 6 to 8 p.m. Monday at the Forgie-Snyder Funeral Home, 1032 Broadway, East McKeesport, 412-823-8083. Everyone will gather at 11 a.m. Tuesday at the Funeral home for a blessing service. Interment will follow at the Calvary Catholic Cemetery in Greenfield. Memorial contributions can be made to the American Heart Association at www.heart.org. For online condolence please visit www.snyderfuneralservices.com. To send flowers or a memorial gift to the family of Gabriel "Big Gabe" A. D'Andrea please visit our Sympathy Store. Originally published February 11, 2019. "Mark E. Eisaman" || "Mary Cipicchio"